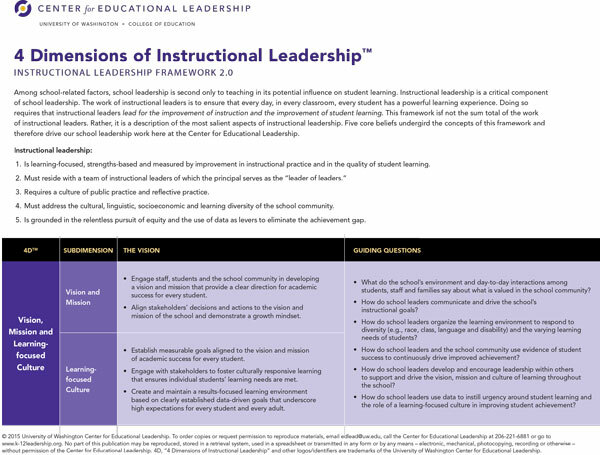 The 4D Framework describes the essence of effective instructional leadership and guides school leaders in improving teaching and learning for all students. Among school-related factors, school leadership is second only to teaching in its potential influence on student learning. Instructional leadership is a critical aspect of school leadership. The work of instructional leaders is to ensure that every student receives the highest quality instruction each day. Doing so requires that instructional leaders lead for the improvement of the quality of teaching and for the improvement of student learning. The framework is not the sum total of the work of instructional leaders. Rather, it is a description of the most salient aspects of instructional leadership. The concepts of the framework are based on five core beliefs. They drive our work in school leadership here at the Center for Educational Leadership. Instructional leadership is learning-focused, learning for both students and adults, and learning which is measured by improvement in instruction and in the quality of student learning. Instructional leadership must reside with a team of leaders of which the principal serves as the "leader of leaders." A culture of public practice and reflective practice is essential for effective instructional leadership and the improvement of instructional practice. Instructional leadership addresses the cultural, linguistic, socioeconomic and learning diversity in the school community. Instructional leadership focuses upon the effective management of resources and of people — recruiting, hiring, developing, evaluating — particularly in changing environments.